Spring has sprung (finally! ), and with it comes our appetite for updating the home for the new season; seeing in the latest interior styles to make for picturesque but practical living areas that fit with the latest trends. Indeed as often with design and creative endeavours, the latest style trend featuring in interiors looks back to times gone by – and this time, it’s a style we’d consider timeless, so something worth investing in to create a great looking and well put-together room for years rather than just months. That trend? 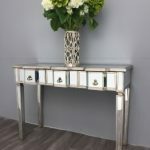 Glamorous style 50s flapper-esque mirrored furniture from the Charleston Range. Think vintage dresses, think retro dance halls, think glamour; but this time updated with minimalist interiors with whites and pastels complementing these statement pieces for a clean but chic effortless feel. The Charleston range takes luxury interior design and translates it into simple classic styling. There’s a rush now amongst those shopping for interior pieces to find elegant items that add some beauty to a room but without overpowering; instead creating a stylish backdrop for life rather than dictating it. This allows those decorating to add their own flair and signature touch to a few pieces rather than clamber for space to fit everything in. The style aesthetic remains the same but can be complemented by smaller items to the homeowner’s liking, which are also of course later easily chopped and changed as seasons move on and they gain new pieces. This approach is flexible on both the look and the purse strings – avoiding constant reinvestment in larger furniture, but still allowing for easy tweaks as and when desired. The Charleston furniture range is therefore the perfect choice for elegant bedrooms or living rooms: living spaces that are well-used and should be conveying an essence of allure and refinement in order to calm you and maintain a happy, healthy living vibe, but also spaces that let you play about with the style should you so wish to. 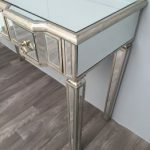 Stylist Tip: Mirrored furniture invokes images of glamorous eras past but remains enduring no matter the year… and when paired perfectly, can’t be beaten in terms of sophistication. 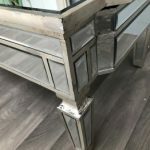 The key to effortless interior styling with the Charleston range of mirrored furniture is to pair pieces that will work together practically in a room without overpowering it. There are a few combination sets that we feel work well, with which we see the results in customer’s homes time and time again. 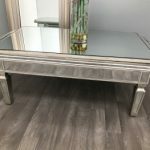 For a living room, you can pair the Charleston Coffee Table with the Charleston Mirrored Media Unit to gain not just matching flair for your primary living space but also some handy hidden storage! 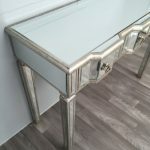 The Mirrored Media Unit contrasts the mirrored glamour of times gone by with modern technology and is functional too; holding not just your television but any other accumulated ‘bits and bobs’ from the room in its three roomy drawers. A shelf hides away any TV mags/wireless routers/smart TV boxes nicely and the antiqued silver wood edging is to die for – this is really effortless old-school glitz. In front of the Mirrored Media Unit (but close enough to your seating for easy access, of course), the Charleston Coffee Table makes for a stunning finishing touch. 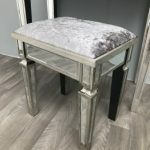 This piece too blends form with function as the top lifts off for added storage space underneath; or just the perfect height dining table for a TV dinner. There’s no need to compromise style or substance… we have both covered beautifully with this pairing! 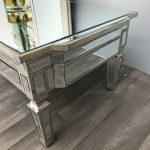 In a hallway, consider combining the Charleston Mirrored End Table with the Charleston Console Table. 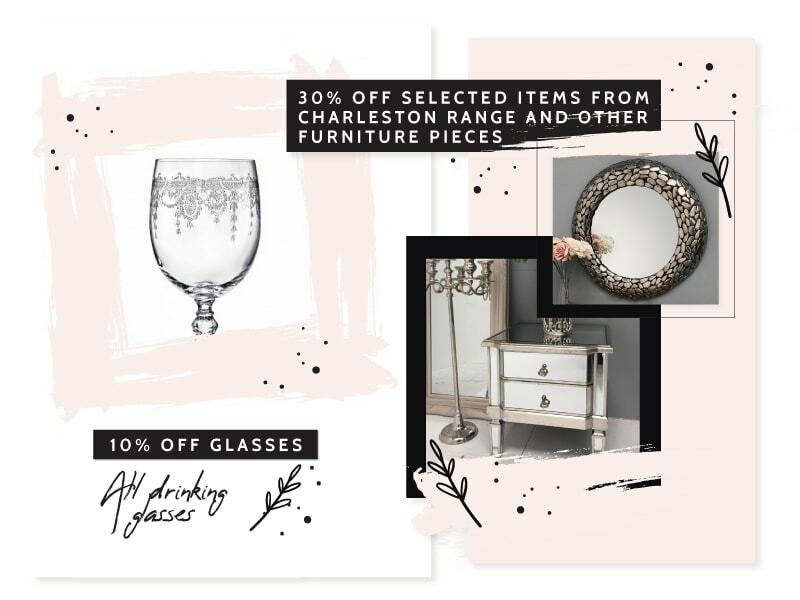 These complementary furniture items slot nicely into any spare space and can be complemented with a single statement flower in a vase for a minimally chic allure. These items perk up any space without the need to add much else and make for a great storage space for all of those ‘in-between’ items that otherwise seem to clutter hallways and landings throughout the home. Hallways can so easily go bare and forgotten about with nothing in but queues of shoes and coat hooks, so keep yours looking dapper with just a pair of strategically placed mirrored furniture pieces and never again need apologise for the state of your home as a guest enters. For beautiful bedrooms, the Charleston range boasts plenty of pretty pieces to shape up your space. 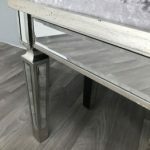 Often purchased together are the Charleston Vintage Mirrored Side Table to act as a bed-side space each side of your resting spot, alongside the Charleston Mirrored Stool and Mirrored Dressing Table with 7 drawers. 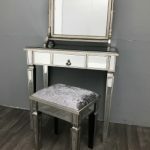 These recreate wonderfully the Hollywood glamour of a dressing table space but more practically; with plenty of nooks and crannies for storage so the table itself doesn’t become cluttered with bottles of lotions and potions. Add a mirror to the top (lights optional!) and decorate artistically with beautiful perfume bottles, vintage powder puffs and elegant jewellery draped strategically. There’s no way to better start your day than emulating the glitz and glamour of Hollywood classics!